Introducing the AW-HE130; a pan/tilt/zoom camera incorporating recently-developed high-sensitivity; low-noise 1/3″ 3-MOS imagers that produce stunning pictures; even in low light conditions. Revolutionary new features include Power over Ethernet+ (POE+) for easier integration; and multi-stream transmission of H.264 HD video and audio (up to 1080/60p at 25Mbps.) 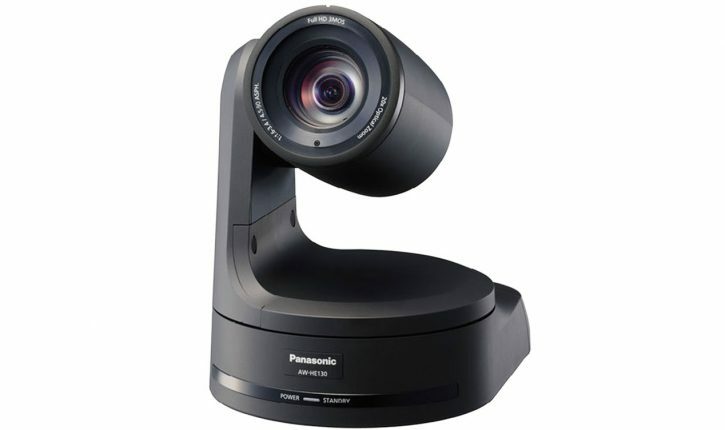 The HE130 adds many innovative features to Panasonic’s AW-HE120 PTZ; which has become the de facto standard remote control camera for educational; government; and house of worship use; and is likewise prevalent in news; staging; sports; and reality television production. Additional new features in the HE130 are a 3G-SDI output (up to 1080/60p); stereo mic/line-level inputs for embedded and streaming audio; a Night Mode for hi-res; near IR video acquisition (using an optional IR-illuminator in the 900nm range); an Optical Image Stabilizer (O.I.S); and IP-Live Preview for remote control and management of up to 16 cameras via Browser. With an exceptional signal to noise ratio of 60dB (F8/2000lx; minimum illumination; 2.0 1x); 1000 TV lines of resolution; and such advanced features as 12-axis color correction and Panasonic’s exclusive DRS (Dynamic Range Stretch) and Hybrid Digital Noise Reduction; the HE130 continues to set performance standards for integrated pan-tilt cameras. The HE130 includes the same new three 2.4 megapixel MOS imagers and Digital Signal Processor (DSP) used in Panasonic’s latest broadcast camcorders; such as the AJ-PX270. Equipped with a fast F1.6 20X zoom lens plus a new high-res 1.4X digital extender; the compact HE130 is ideally matched to demanding applications in sports; rental/staging; news; and business and institutional video. Standard professional interfaces include HD/SD-SDI; HDMI; and SD composite; as well as 3G-SDI for single cable delivery of high-quality content up to 1080/60p. 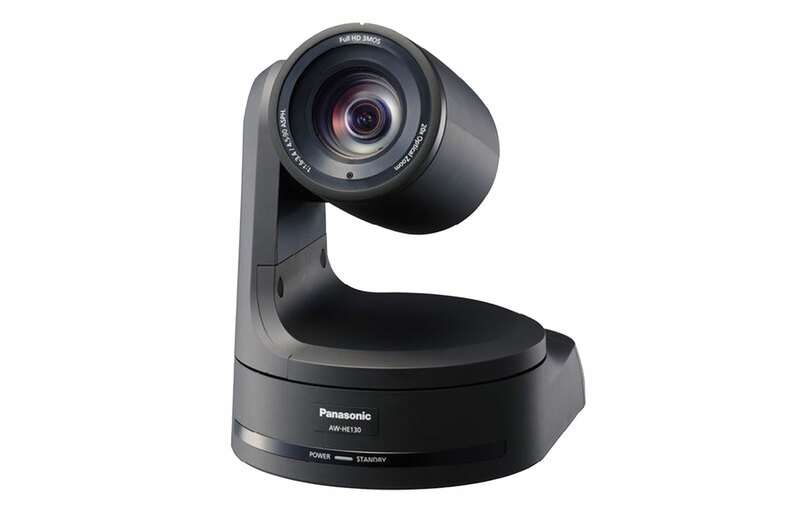 In addition to continuing RS-422 serial compatibility with controllers designed for use with previous generations of Panasonic remote camera systems; the HE130 supports both direct and Web-based IP remote control. Direct IP or serial control is possible using Panasonic’s AW-RP50N and AW-RP120; as well as appropriately programmed systems from Crestron; AMX; Winnov; and other manufacturers. In addition; the camera’s built-in Web-server enables secure control; live preview; and setup from browser-equipped PCs-anywhere in the world. Other useful new features include: native 24p and 30p output for teleproduction; iPro support for synergy with Panasonic’s high-end security systems; digital access authentication; MAC/Android support for web monitoring; color adjustment by color temperature; and VISCA remote control support. The HE130’s optical zoom lens covers an extended range of shooting situations; from wide-angle to ultra-telephoto; with 35mm equivalents of 32.1 mm at the wide-angle end to 642.5 mm at the telephoto. The built-in remote-controllable four-position ND filter (clear; 1/8; 1/64; IR thru) facilitates flexible exposure control in brightly lit shooting situations. The camera’s integrated pan-tilt head covers a wide range of motion; with a pan of +/-175° and a tilt of -30° to 210°. The pan-tilt driver combines a high level of responsiveness with static precision. An NC (Noise Criteria) level of 35 is maintained for shooting in noise sensitive environments. Up to 100 preset positions and camera settings are stored in the camera; more than enough for the most demanding large venue installation. The camera weighs only 6.8 lbs. ; and consumes just over 21 watts at 12 VDC.